The Foundation’s highest authority resides with its Board of Directors, which is comprised of government officials, eminent scholars and financial contributors from the business community. Seats on the Board are held for a three year term, with successors elected by the sitting Board in accordance with the Organizational Charter of the Foundation. 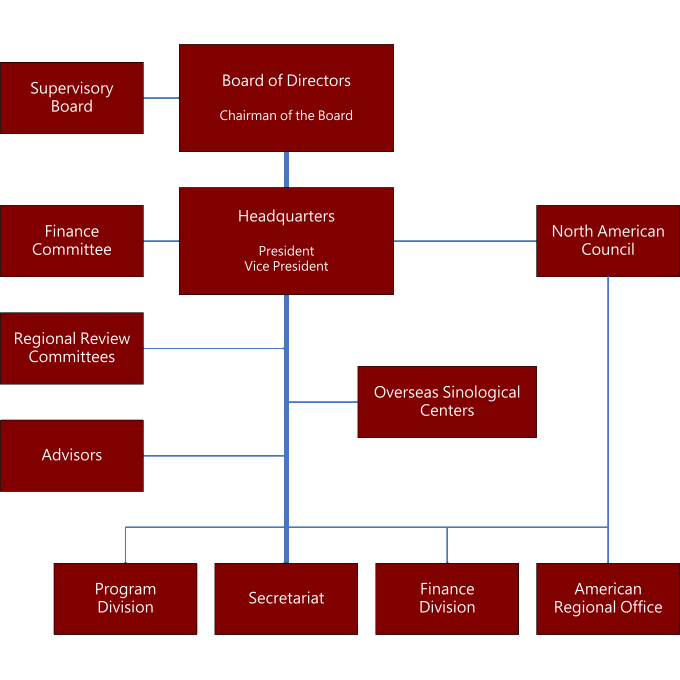 The Board also elects Supervisory Board members, who also hold office for three years and are responsible for overseeing the Foundation’s endowment, financial policy, expenditures and grant allocations. In addition, a Finance Committee works to oversee the Foundation’s financial operations.The Foundation’s headquarters is in Taipei, where the President oversees all of its affairs, assisted by the Vice-President. There is also an American Regional Office in McLean, Virginia, which is run by its own Chairman. The Foundation has established five regional review committees: Domestic Region, American Region, European Region, Asia-Pacific Region, and Developing Regions. The 55 members of these committees, who serve at the invitation of the President, bring the expertise of scholars from a wide range of academic fields to assist the Foundation in evaluating grant applications. In addition, the Foundation has appointed a number well-known figures at home and abroad to serve as Advisors and provide guidance for its operations. The Foundation’s day-to-day operations are administered by its Taipei Headquarters and American Regional Office.